Looking south from the south end of Bury Bolton Street station in October 2010. The lines leading straight on follow the original 1846 route towards Clifton Junction. 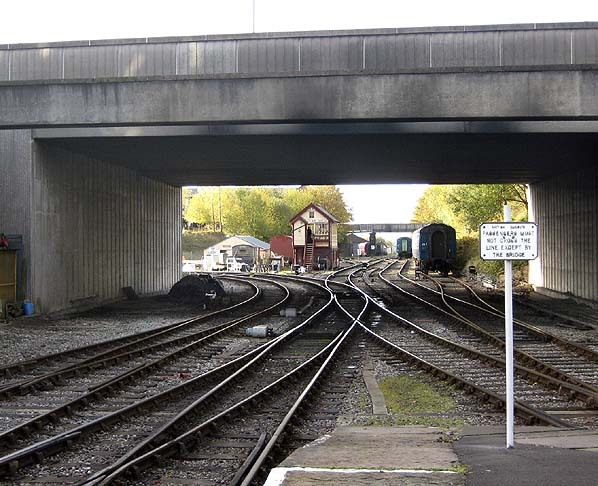 Since 1991 they have only continued for about one mile to the former locomotive depot and the electric train sheds. The lines going off to the left follow the route of the Bury East Fork and then continue on to Heywood. The 'new' ELR has remodelled the junction so that the East Fork is now the main line. This is because the route to Heywood forms part of its passenger train operation.